I met the group at 5:00am for a ten mile run. We ran from the Old Village out to Sullivan's Island. This was a shorter run, but at or near marathon pace. We started off with a warm up mile (12:25) through the Old Village (this was with the whole group). My legs were really tight from the track workout on Wednesday, I think I could have used another mile of warming up. Andrew, Cathy and I picked up the pace and ran towards Sullivan's Island (8:55, 8:40, 8:48, 8:52). 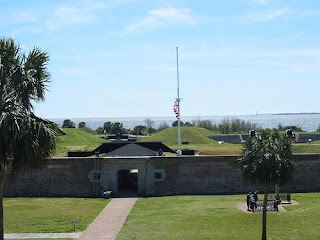 We stopped to refill our water at the half way point, which was at Fort Moultrie. It took a little while to get our pace back up, but we got up to it and stayed with it until we got back to the Old Village (9:14, 8:59, 8:52, 8:48). We finished up with a cool down mile that we all needed (11:02).